The Kent coastline is known by golfers up and down the country and home to three historical Open Championship venues. The seaside stretch of golf around Sandwich is the focal point for one of England's most impressive collection of links golf. At the heart of the complete Kent Tour is Royal St George's, an epic links course etched in Open Championship history. Arguably England's best seaside course, it is a bucket list course that shouldn't be missed. 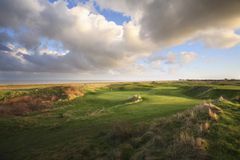 Its neighbours are almost as noteworthy and are able supporters in this great triumvirate; Royal Cinque Ports and Prince's are classic and traditional links courses, sure to give any golfer an experience they will never forget. Littlestone, North Foreland and Walmer & Kingsdown offer golfers testing links golf and are undiscovered gems in Kent. To plan your perfect tour speak to our dedicated Kent specialists.